We understand that in small towns, someone has to volunteer to help. Tables and chairs have to be put away after the meeting is over. Community organizations need monetary contributions to fund their projects. We serve on local committees, donate to local causes, and proudly sponsor two ongoing company community programs: Honor Students and Children's Tours. See below for more information on these programs. For 28 years, we were the primary sponsor of the Stearman Fly-In. The children's tours are free. We love doing them--just give us as much advance notice as possible if you would like to schedule one. 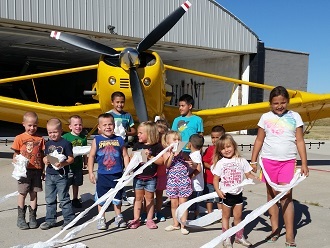 We'll show the children several airplanes in the hangars, and we'll likely fly an ag airplane just for them! We have done a lot of these tours over the years, and there are many more pictures of happy children here: Do yourself a favor and click on the photo so that you can scroll through the amazing images. We began our Honor Student Recognition Program in 2005 as a way to recognize and reward academic excellence in our High Schools. Every May, we provide a letter of commendation and a small memento to the top five students in each high school class. These awards are presented at the Awards Ceremony in the respective schools. We also list the names of the students here on our website. We believe that scholastic excellence has always been important, but that it is increasingly vital in our rapidly changing, technological world. Initially, the award was a t-shirt, but in recent years, it has been a personalized USB key or a charging brick. In 2018, it was a wireless bluetooth headset. The words Honor Student and the year are emblazoned on the device or the shirt. 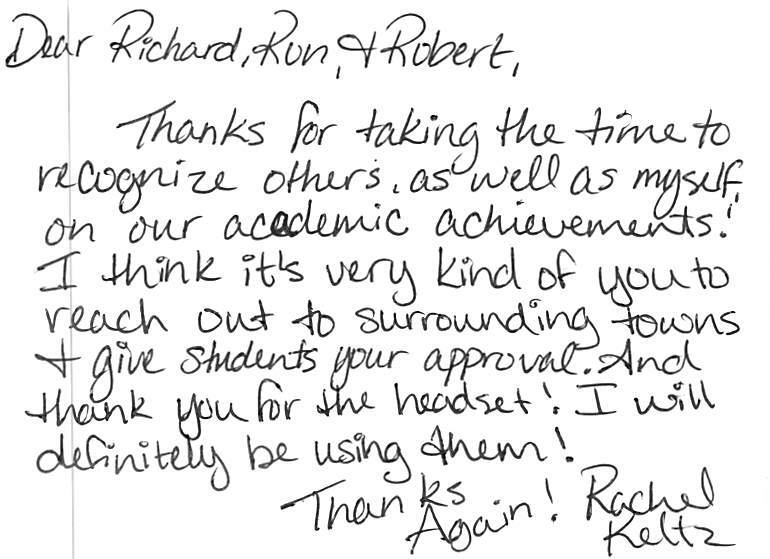 The Honor Student Program is our way to recognize excellence and to say "Job well done!" to the top 5 students in each class. Please click here to see a complete list of the recipients. It's a great group! In the mid-1990s, few people knew about the Global Positioning System (GPS) or how significantly that it would affect their world. Grace Flying Service realized that GPS, when coupled with a then-new system called differential correction, could provide significantly better guidance for crop treatment, whether aerial or ground based. So 20 years ago, we embraced the new technology wholeheartedly, spending significant resources to perfect a system. At the time, we had to generate our own differential signal, using a 900 MHz antenna and transmitter, and a special card in a dedicated desktop computer: it was neither simple nor easy. Now we simply use WAAS--like everyone else. WAAS works quite well but is ironically slightly less accurate that the home-brew system that we used two decades ago. That early investment in the new GPS technology paid big dividends: we soon had an airborne guidance system, which provided real time accuracy of less than two feet. Using a light bar mounted on the aircraft fuselage for guidance, we were able to construct and fly incredibly precise electronic patterns over our customers' crops, guided by satellites orbiting 8,000 miles above the earth. At the time, it seemed unreal. On every application today, we use an updated version of that original GPS system: every load and every swath. It's even more valuable than we ever hoped that it would be. We have a 4 KW solar system on our office. The system was installed in two stages, several years apart. The project is not only interesting, but works as advertised. We have a separate page which describes and analyzes the solar system in great detail. Click here for more solar photos, details, and some charts and graphs. Handling pesticides is serious business. Our loading facility easily exceeds all state and federal requirements. With its epoxy coated floor, double-walled stainless steel sumps, and the 40-mil plastic liner which is buried beneath the entire facility, our loading facility represents a serious commitment to protecting the environment. From the instant that arriving pesticides are unloaded until the empty containers are triple-rinsed, all products remain inside the confines of our secondary containment. Our loading pad has a unique design which is being copied--with our blessing--by other aerial application firms. We have a short history of the company, as well as information about modern agriculture and aerial application. You can read it here, on the About Us page.